¡Mi familia! 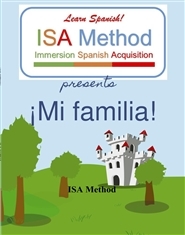 was created as part of the supporting material to the ISA Method Spanish acquisition curriculum. That supporting material includes other books in the series, flashcards and posters. ¡Mi familia! introduces the topic of family through the adventures of the main character, Isa, a 6-year old girl. Through a lively story, Isa introduces us to her family at a family reunion and gives us the Spanish words for different members in the immediate and extended family. The book is written in Spanish, with English subtitles. It also highlights key family terms. This book can be used as part of the ISA Method curriculum or it can be used separately. Thanksgiving is a fun holiday filled with history. 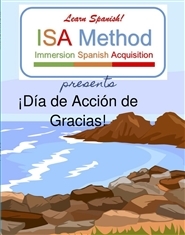 ISA Method's "Dia de Accion de Gracias" introduces Spanish terms related to the celebration. Body parts are some of the things a child first learns. 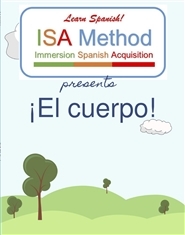 ISA Method's "El cuerpo" introduces the Spanish names for the body parts a child already knows. Farm animal names and sounds are one of the first things a child learns. ISA Method's "Los animales de la granja" introduces the Spanish names of farm animals a child already knows. Colors are useful, fun words a child easily learns. 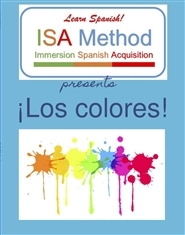 ISA Method's "Los colores" introduces the Spanish names for basic colors a child already knows.